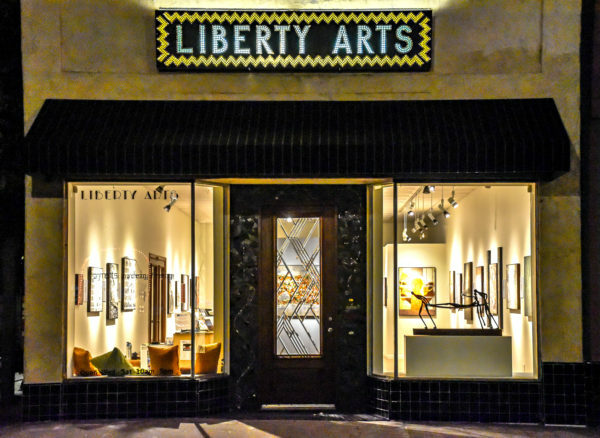 Liberty Arts in Yreka is a hidden gem, with 10 years of success and a very dedicated following. Their art is so strong, openings typically draw 150 patrons. Investing in a 40-minute drive will lead to the best California contemporary art north of the Bay Area. Liberty resides in the amazingly authentic old town district of Yreka; where the un-gentrified Americana west may be experienced up close and personal. Perfectly paired with coffee and pastry up Miner Street at Zepher Bookshop, window-shopping and 1859 architecture, Liberty Arts gallery is definitely a destination. “Fragments: An Archeology of Memory” (showing through November 30th) offers a very rare opportunity to see sculptor Dennis Smith’s table models of the very large outdoor figures, on loan from private collectors. It seems very unlikely they will ever again be exhibited this way. Smith is a master sculptor and creator of one of the very best Vietnam memorials in the United States—and it happens to be just outside of Weed. The sculptures are presented with Kendall Johnson’s ethereal landscapes of memory, painted from selections from his finely written Vietnam journal. Kendall Johnson is a painter and writer who spent a career as a clinical psychologist, and who did not deal with his Vietnam time for 50 years, And then he did. This is his experience and it is engaging and smart—especially beside Dennis Smith’s extraordinary work. The paintings are pleasing to the eye—most of them. Johnson’s artist ability is good, but he depends on the entirety of work to bring his story forward; and that is what it is, storytelling. There is no message here, only experience—although this show has some surprises. The softness of the abstract images hide many secrets of the war experience. Kendall Johnson’s strength is in his words and he writes beautifully. His paintings support the exhibit fairly well, and some are strong enough to carry the show. This exhibit has the energy of a storytelling event, except is in prose, paintings and Smith’s masterful sculptures, and it works. Two men coming together and beside one another to remember and share and show and explain, what the emotional shrapnel of war does after 50 years in the body and the mind.